I remember one night when my dad and brother were gone, and mom and I wanted to set the VCR to record a TV show. I can imagine my children shaking their heads at that archaic technology, but at the time it was super cool that we could do such a thing. So we got out the instruction booklet. I can’t remember if mom read and I pushed the buttons or if I read and she pushed the buttons. We looked at each other and burst out laughing. We had done all those steps and then they told us what to do first? We never did get that show recorded. But first I should have prayed. But first I should have asked God for help. But first I should have sought God’s wisdom. 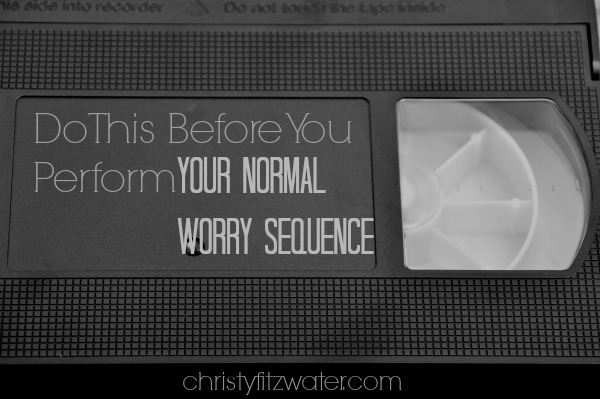 This is the action we should take before we walk through a sequence of worrying about things. I have honed the practice of gut-twisting worry until I can perform it in my sleep, but I would like to be done with anxiety. I want to be a person of peace, and I know you want a peaceful heart, too. So we need to do things in the correct order. 1) Talk to God about it. Thank you, Christy, for a great reminder this morning to always pray first, in every situation, seeking God’s help and His wisdom. I needed this reminder today. I think we all need to be reminded constantly to go to the Lord first, before we freak out about things.